Have you been paying attention to your local Japanese clothing store mannequins lately? With big, sparkling eyes, their anime-style faces are better placed in a Tezuka Osamu manga novel, rather than your local fashion store! Given how the real-world inspires manga, it is interesting to see this inspiration go full circle and return to life! The model series shown here, “Charamore 2”, were produced by “Heiwa Mannequin”, a relatively recent emerging company who first produced this range back in 2002 from its design studio based in Kawaguchi City, Saitama Prefecture. The domestic mannequin industry emerged in the 1920s out of the repairing of foreign imports. Since then it independently evolved in its own way through symbolic designs and characterisation. Thinking about Japanese manufacturing more widely, let’s explore the hidden symbolisation in the industry. Go to Akihabara and you’ll witness manga characters jumping out of their 2D worlds. Forget Thunderbirds – these are 2D characters morphing into actual 3D figurines, often life-sized versions. So what is the difference between mannequins and figurines? Figurines and their clothes are designed together to seamlessly fit, but a mannequin is designed to style any clothing so can’t deviate from the true body shape in the way some figurines do. Originally, mannequins were inconspicuous by design. Selling clothes was their purpose. Even so, they are as fundamental to the clothes shop as the printer is to the office, or the assembly robots to the car manufacturing plant. Needless to say mannequins are well tuned to the influence of society. 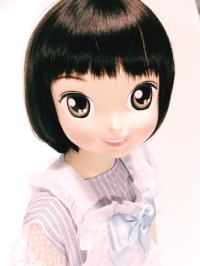 In 2002, when anime mannequins first appeared, Akihabara’s “moe” culture was breaking through. Heiwa Mannequin’s chance to exploit this trend arrived via a commission from a famous children’s clothing manufacturer. In an attempt to understand this relatively new scene, the designers used research funds to build a figurine collection to better understand the culture. Around this time, they also began to receive multiple assignments for anime character mannequins, from TV events to pachinko parlours. Their experience and newfound knowledge of the industry was quickly put to good use. The greatest characteristic of these anime mannequins is undoubtedly their symbolisation of 2D style into life-life, recognisable 3D expressions. If you think about how when visual information is sent to the brain when looking at things, it mostly consists of deformed characteristics that are later reconstructed in the mind. To see how this works, consider how, despite technology, hand-drawn portraits are more useful to the police as facial composites. In 2000, the police established a database for searching such portraits on file. The advantage of the hand-drawn portrait is arises because the unique characteristics remembered by the witness are then reflected by the artist. This makes it easier to identify the individual at speed. Interesting CG techniques were being developed around the same time. Take “cel-shading” (or “toon shading”), a rendering technique to give fully 3D models a 2D style (2000’s Jet Set Radio was one of the earliest video games to take this style to market). In the anime world, it can be used as a technique to help personify via 2D symbolisation the anime characters while the underlying models are built in 3D. This overlaps with Japanese mannequin history. In the beginning the industry was about advancing symbolisation of the human body. To tell you the truth the mannequin face is not based on Japanese or Western face, but the result of original modellers simply trying to create what they perceived to be most beautiful. All modelling detail including make-up is done by hand, not with a computer, an approach which appears to be highly valued throughout the rest of the world too. These aesthetics have helped influence competitors across Asia and Europe. Even if those outside Japan are not necessarily anime-style, they have ridden the influence of anime’s growth. With these 2D stylised 3D mannequins growing in popularity, you would be qualified in commenting on their unnatural likeness. In the anime and manga world, object characteristics are distorted much like how a caricature is. With symbolisation it’s all about representing reality, not recreating it. Manga can be a treasure box of implications for manufacturing – after all, our anime and manga industry is the world leader, both in terms of quantity and quality. If we apply this symbolisation culture to Japan’s future manufacturing, consumer robotics is an obvious destination. First appearing in 2000, Honda’s Asimo has amazed people around the world. 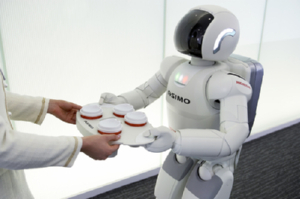 Both at the time and through its continued development, Asimo is the most advanced bipedal consumer robot in existence. And the face? Covered by an astronaut-style helmet, Asimo has no facial expression. But rather than a shortcut solution, the issue of humanoid faces is a serious challenge to the development team. Even with all the trials conducted with humanoids’ emotional impact on human beings, a simple solution has yet to be found. Giving robots a face increases affinity up until a point, beyond which we reach the “uncanny valley” – the hypothesis that describes how our emotional response to a robot’s appearance will go from empathy to revulsion before returning to empathy as the robot’s appearance approaches perfect human likeness. The dilemma of not being able to distinguish humanoid and human is one for the future, and until the technology catches up, current models stop short of that “uncanny” line. Like with the contrast in the humorous but grim-faced C-3PO, when you mistake a mannequin with a real person, you may freak out. Particularly children, more familiar with cartoon characters (like Doraemon in Japan), will burst into tears. In order to overcome this “uncanny valley” phenomenon, look at our country’s proud symbolisation techniques with anime. The process of adapting these 2D worlds into realistic 3D models perhaps hides the answer to this issue. If you scale up to life-size the proportions of any character, like Chibi Maruko-chan, you will not end up with human proportions. 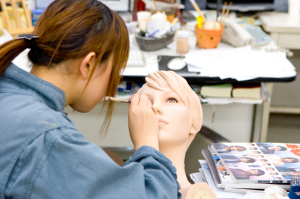 At Heiwa Mannequin, when making character mannequins, the designers made subtles changes to the original 2D faces and bodies. With their 3D conversions, such adaptation hints at overcoming the “uncanny valley”. Whether you say we watch too much TV or read too many comics, the growth of the anime and manga industry since the 1960s has impacted every Japanese individual. Given this crystallisation of culture, you’ll know about moe-kei. Moe can be loosely defined as a kind of love or passion for fictional characters. To what extent this moe aesthetic (“moe-kei”) is apparent or not, comparing Japanese to foreign markets you can see this definite trend. You can say this was also the aim of Heiwa Mannequin’s modelling team. Even if most young people watch too much anime and read too much manga, adapting to this reality and their view of the world is surely the destiny for this company. Understanding the changing outlook of a generation of young people brought up on anime and manga surely will impact on our collective ability to cope with and bridge the real-virtual gap from merging human traits with robotics technology. Surely, the worry of confusing identity between humanoids and human beings will disappear altogether. 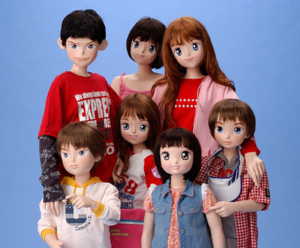 Can you envisage a future dominated by consumer robots with anime faces? You never know.